MicrobesOnline includes operon predictions for every bacterial and archaeal genome. Each pair of adjacent genes is predicted to be in the same operon, or not, based on how far apart they are, whether they are conserved near each other in other genomes, whether they are predicted to encode proteins with related functions, and expression data (if available for this organism). A novel method for accurate operon predictions in all sequenced prokaryotes, M. N. Price et al., Nucleic Acids Research 2005. 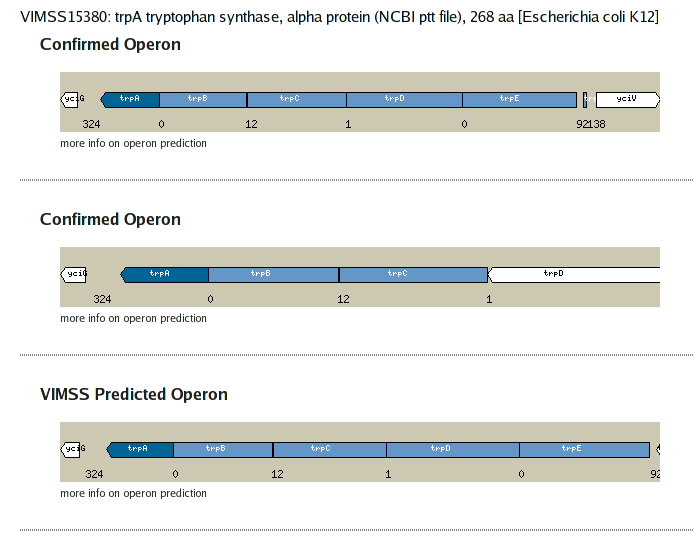 All operon predictions are displayed graphically on the website as part of the locus info page. Experimentally characterized operons are also provided when available. In the operon viewer, the query gene is shown in navy blue. Nearby genes predicted to be in the same operon are colored in light blue. The next genes upstream and downstream of the operon are are shown in white. The arrowhead indicates the transcription direction. The numbers appear below the genes indicate the intergenic distance between two adjacent genes. Negative numbers indicate overlapping genes. Each gene is labeled by its gene name, synonym or VIMSS locusId, and is hyperlinked to its locus info page.